The first time a voice breaks across the airwaves — one that isn’t screaming, singing or growling — it’s a strange, spooky androgynous one. It’s the otherworldly voice of Andria Marcussen, one half of the DJ duo that has piloted the late-night show “Confinement Loaf” on the University of Idaho’s campus radio station for the past three years. Each Saturday after nightfall, Marcussen and her husband, Ted Kelchner, 43 and 44 respectively, travel from their remote Idaho cabin — a place cut off from the Internet and television and most of the rest of the world — down the dark hallways of the University Student Union Building and into the third floor radio station. There the pair transmits a blend of psychedelic rock and metal — ranging from the earliest rumblings of Blue Cheer to the newest Neurosis album — to a devoted fanbase around the country. Their stripped-down, technology-light approach to life is intentional, Marcussen says. And so it makes sense that they’d devote themselves to the dying radio medium. “Confinement Loaf” isn’t just a show they host, she says — it’s a program they meticulously plan and ruthlessly scrutinize each week. It’s the cornerstone of their lives. Sometimes it’s the only connection they have to other people. Even more, it’s the couple’s effort to show the deep, personal connections that can be made through music and radio. And it’s an idea they had long before they even knew that Moscow, Idaho, existed. With fresh college degrees in their pockets and a car filled with everything they owned — records, a stereo, a dog — Marcussen and Kelchner drove away from their upstate New York college and traveled as far as their money would take them. That was in 1990. They got a flat tire in Moscow, Idaho, and after seeing that the local gas stations offered free air for tires, they decided that was where they would stay. In a way, that free air was a metaphor for something else they would find in Moscow: a free-form college radio station, where the airwaves were populated without restriction from a domineering parent company. “That’s what we did as kids — we listened to the radio, because we grew up in the ’80s. The ’80s was a time of MTV, and it was a time of really bad music. And we didn’t dig that at all,” Marcussen says. She says that growing up glued to radio programs like Dr. Demento and college radio stations, she and Kelchner both felt that radio was about communicating something special. Something that felt deeply personal. Radio is about experiencing a moment in time. “You and that DJ are sharing something together. They’re talking to you,” Marcussen says. In 2009, some 19 years after their arrival in Idaho, the two radio fans finally made their own debut on the late-night airwaves. It came at a time when they were watching their favorite shows drop away and as the DJ became a thing of the past. With “Confinement Loaf” — an admittedly niche program — the pair wanted to ensure they were offering something that no one could ever hear on mainstream radio. But they took things one step further than most community or college radio programs. 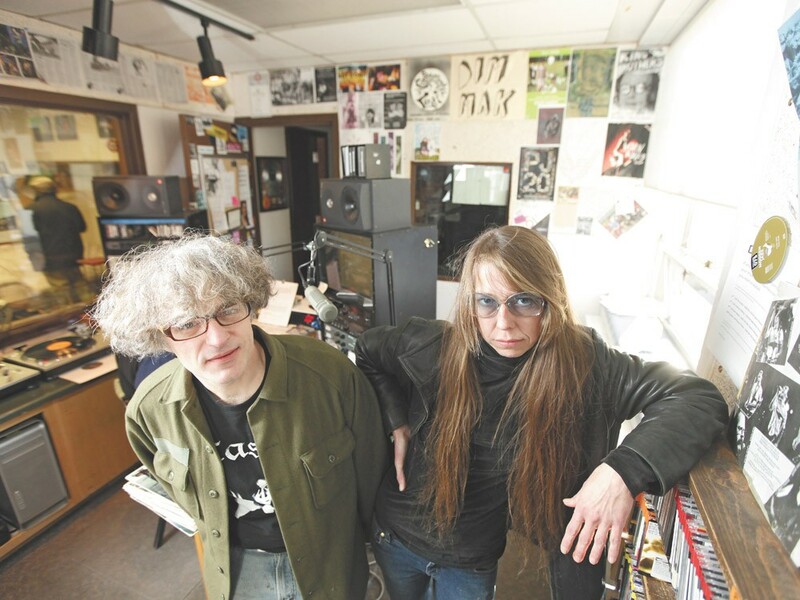 Marcussen and Kelchner would invite bands on tour to stop by KUOI for on-air performances and doggedly pursue national acts for interviews. In their five years on the air, they’ve interviewed 27 different bands, including St. Vitus, Baroness, Coalesce, Rosetta, Black Cobra, Red Fang and Black Breath. Marcussen laughs as she talks about the current generation of kids — people who’ve never even known radio DJs like she once did. Not long ago, a man called the program to say that his teenage son didn’t believe that Marcussen and Kelchner were actually at the radio station, hosting the show live. She says that they’ve gotten word that lots of Moscow teenagers stay up to listen to their show. And that makes her and Kelchner feel like there’s something that they’re doing right — like they’re conjuring that mood that sucked them in as teenagers so many years ago.